Middle East, August 1: Egypt — Will Protesters Defy Government Threat to Disperse Them? 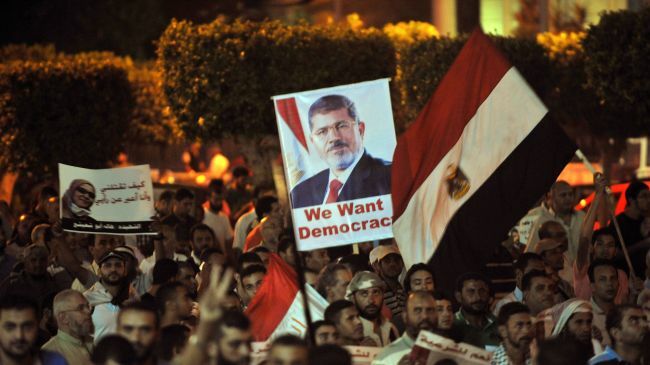 Protests in support of deposed President Mohamed Morsi continued overnight, despite a warning by the Egyptian Cabinet that it has ordered police to take “all necessary measures” to end demonstrations. “The continuation of the dangerous situation in Rabaa al-Adawiya and Nahda Squares, and consequent terrorism and road blockages are no longer acceptable given the threat to national security,” the interim Government said in a statement on Wednesday. The Ministry of Interior later said that police would take “gradual steps” to break up the protests. The pro-Morsi protesters have held sit-ins at the two squares in and near Cairo since late June, days before the President was overthrown by the military. On Wednesday, Egyptian authorities also referred the leader of the Muslim Brotherhood, Mohamed Badie, and two other senior officials to a court on charges of inciting violence. Blogger and media fixer Mohamed Hassan has been detained again, this time after a dawn raid on his home on Wednesday by masked Ministry of Interior agents in civilian clothes. Hassan — @Safybh on Twitter — is known for his blog, which he suspended in April. Hassan was arrested on 21 April 2012 as he escorted reporters to protests in villages and was reportedly severely beaten his detention. He was released the next day, but re-arrested at a checkpoint in Sanabis with journalist Colin Freeman from Britain’s Sunday Telegraph and questioned further. They were taken to the Exhibition Center police station. Hassan was interrogated about his connection to the journalist and they were later released without any charges. In June 2012 Hassan was summoned for interrogation, and was accused of writing for websites and newspapers without a license, illegal gathering, and tweeting. Hassan has been a fixer for many international reporters and was involved with this report by Dan Rather Reports in March 2012.